Atmospherics: First the location. Sangam Courtyard is on a main road in an easy to find location. 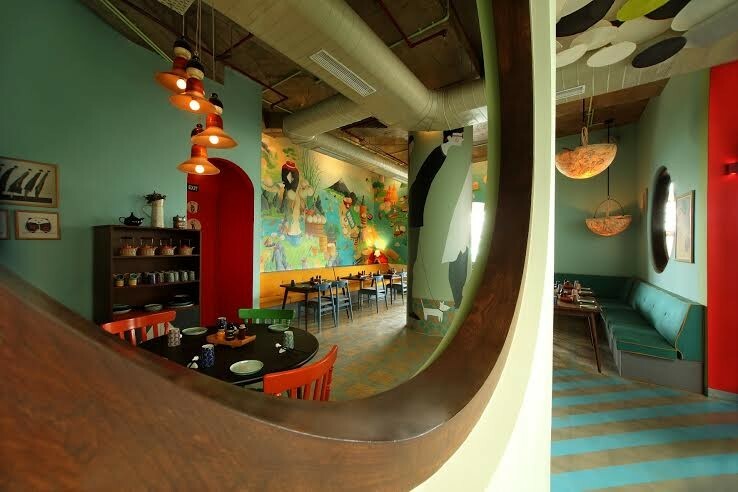 Though it is packed with restaurants – some by Delhi’s most important players – Fatty Bao is the first one to start. The playful sketches on the walls and the bright, almost child-like colours call to mind AD Singh’s other project, Guppy by ai, and it comes as no surprise to learn that both have been executed by the same person. The playful aspect of Fatty Bao is the colour on the walls, the quirky service-ware and the way the restaurant has been cleverly divided into sections. On the plate, however, it is all serious. Or, to put it another way, many South-East Asian rules have been broken intentionally, but the result is always great taste. The best part is that you don’t have to order the traditional way: soup, starter, main course. And the prices make it a steal. Also, it is a menu that will need several visits to fully explore. Table talk: Do not miss the baos. Rather than being closed buns, they are cloud-like pillows of softness, folded over and filled with your choice of meat or vegetables, a sauce and salad vegetable for textural interplay. The best of the lot is, expectedly, the char siu (Rs 395) containing imported pork belly, green apple kimchi, hoisin sauce, sesame oil and scallions. The green mango and papaya salad (Rs 225) was a masterpiece, with a typically Manu Chandra touch. It had juliennes of tender coconut that cut out some of the sourness of the raw mango. Fatty oysters (Rs 445) is one of the many stars on this menu. 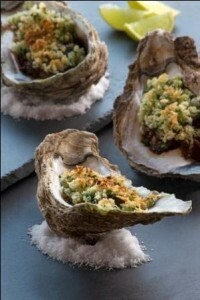 Four plump, flavourful oysters, whose briny flavour was highlighted by flecks of chorizo, gently grilled with breadcrumbs. Fatty pho (Rs 465) was a delightful cross between a Japanese ramen and a Vietnamese pho. Ramen noodles is one of the few preparations that is alkaline in nature. How this casual diner with the playful vibe has managed to get this – and other obscure elements – of its menu correct is a mystery. Plus and minus: Go before the prices spiral. And do make a reservation.